"For more information regarding LG&E, Search Table of Contents in Journal on Home Page"
At approximately 11:30 a.m. I contacted LG&E because the lights in my home are constantly flickering (even turning off and on) when I step into a room or when I am in my bedroom putting on or taking off my clothes. The lights also flicker in my bathroom. LG&E did a "Load test" to find out if the problem was inside or outside of the house. The LG&E Rep. stated the problem was inside the house. At 6:30 p.m. I was severely assaulted through electromagnetic assaults, this caused a seizure and extreme pain. I am also being assaulted with extreme heat, which causes extreme overheating of the body. The Following is a Reproduced Copy of a Notarized Letter that I hand-delivered to Louisville Gas and Electric Company Regarding LG&E Employees Coming to My Home, Turning off my lights doing work regarding (EMF's), Electromagnetic Frequencies when I am not home and Other Employees at Louisville Gas And Electric Company stating, "That they did not send them to my home." On October 12, 2010, I arrived at home around 6:30 p.m. and found a hanging tag on my front door from Louisville Gas and Electric. The hanging tag stated that LG&E was at my house and turned off my lights for about 15 (fifteen) minutes and checked for any problems and did not find any. About 4 - 5 days after that I received a voice mail message from LG&E stating that I requested that they come to my property on October 12, 2010 and if I still wanted them to come to give them a call back. First of all I did not request LG&E to come to my property. I did request them to come out on September 2, 2010 and they came out and did a load test. I did not request them to come to my property on October 12, 2010. After LG&E came to my home on October 12, 2010, that night and every night after I was awakened by projected sound noises and I also started getting extreme muscle spasms. I had just started a job on October 11, 2010 and I slept that night, however after LG&E came out on October 12, 2010, I was awakened by the noises every 1 1/2 hours and only accumulating three (3) hours of interrupted sleep per night. Needless to say on the seventh day I had only had approximately 21 (twenty-one hours) of seep for the entire week and could not function on my job. I told my boss I had to leave as I could not focus because I was not getting any sleep. I was terminated. I called LG&E and was told that they did not dispatch anyone to come to my home, however I have a voice mail message from Jerry Belcher and a hanging tag from my door knob from George Jetter. I called LG&E again today, October 25, 2010 and they again stated that they did not dispatch anyone. On more than one occasion person stating that they are with LG&E, in LG&E trucks, have appeared on my property and started switching lines, barrows, etc. I am requesting a letter stating that LG&E did not dispatch anyone to my home on October 12, 2010. Voice Mail Message Received from (502) 364-8422 on approximately Oct. 16, 2010 or October17, 2010, which was five days after they had already been to my home. "Ms. Marshall this is George Jarret, Louisville Gas and Electric Trouble Dept. I have a work order sent to us, right here, showing us that you were having a problem with your house, right here. I need to come out there and have our crews go ahead and run a test on the outside on our equipment and see just exactly what's going on. At the present time we will probably be there at 10:00 and, uh, if you want to reach me here in the next one half hour, I will be at 364-8422. Thank you." REPRESENTATIVE REFUSED TO SHOW LAST NAME ON I.D. CARD AND REFUSED TO GIVE LAST NAME. 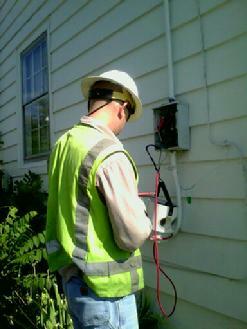 THIS IS THE SAME PROBLEM THAT I HAD WITH THE LG&E REP. THAT CAME TO MY HOUSE ON JUNE 26, 2012. 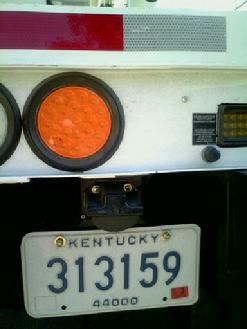 KENTUCKY PUBLIC SERVICE COMMISSION AND LG&E STATE THAT LG&E REPS ARE SUPPOSE TO SHOW I.D. On July 29, 2012 I called LG&E (Louisville Gas and Electric Company) because after they put in the Analog Meter I began experiecing lights flickering and computer screens freezing and this is happening with all three computers. I can also hear a zapping noise when this happens which sounds as if someone is using a type of remote or switch to turn things off or freeze them. Therefore, I believe that something else was put on my house with the Analog Meter. The LG&E Rep. that came to my home on July 29, 2012 at approximately 9:58 a.m. refused to give his last name and would not show his last name on his I.D. card. This is the same problem that I had with the LG&E Rep. that came to my house on June 26, 2012, which I did report to KY Public Service Commission. see page entitled, "Connie Beaten and Arrested" regarding the previous problem with an LG&E Rep. refusing to show I.D. and give last name. 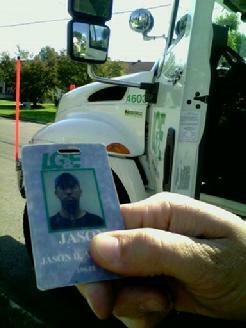 This LG&E Rep. stated he did not want to give his last name and put his finger over his last name on his I.D. card. This is the LG&E Rep. putting his finger over his last name and he also would not give me his last name. This is the License Tag on the truck the LG&E Rep. was in. The license number is 313159.